More or less a port of SMSAdvance to the NDS now under the name of S8DS, as it's a SEGA 8-bit emulator for the DS. The biggest difference from the GBA is probably that you don't have to use a builder to add roms, you can use zipped files directly and the screen doesn't have to be scaled to fit. *Pretty much everything works perfectly. *No scaling needed for most games. *Can scale to correct aspect for PAL, NTSC & GameGear. solo per il gioco in screen lo installo subito!!! P.S:oh FluBBa, un bel emulatore C64 no eh!?!? 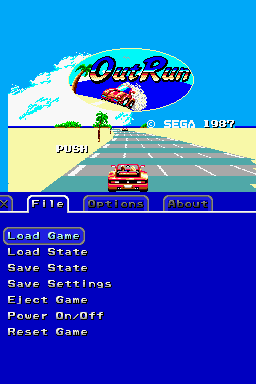 ma outrun non era un gioco per pc recente?